Over the last few days, we have been assaulted with the horrifying images of bodies being dumped into trucks, images of people not only without shelter but also without water, images of desperation and suffering beyond belief — and we have experienced that numbness that comes with helplessness. That is not a good place to be. We ask ourselves, what can we do? How can we help? How can we understand the barriers that keep good people from reaching those in need with food and water and medicine? We feel the distance. We are bewildered by the hugeness of the suffering. We contribute our small amounts of money to a World Vision and to so many other organizations whose feet are on the ground. We pray for the people we know who have been building schools and feeding children long before the earthquake. We watch the news carefully. After the disaster hit, we began to discover how many of our SPU graduates are serving in this desperate country. We have been praying for them. We do what we can. All of God’s children are not flourishing. How do we teach our children about this suffering? How do we teach our students in the face of these powerful circumstances of overwhelming grief? How do we make the world a better place? On this same weekend, we reflect on the great legacy of the Reverend Martin Luther King Jr. I find myself making the connections: What might Dr. King teach us about hope in the face of the hopelessness we see on the streets of Port-au-Prince? What might Dr. King say to us about helping to build and rebuild a viable society for the people of Haiti? On August 28, 1963, Dr. King stood on the steps of the Lincoln Memorial, in front of 200,000 people, and outlined with such moving eloquence a narrative of hope out of the desperation of racial suffering. Dr. King’s narrative comes straight out of the biblical tradition of hope, that great prophetic tradition, where we stare into the face of injustice and despair and hatred and evil and suffering — and yet we announce hope for something better, something more. This is the Christian response to desperation. But this narrative of hope quickly reminds us that we are not out of the darkness yet. There is much work to be done. Indeed, the biblical narrative of suffering and hope does not turn its face from ongoing shameful degradation. The challenges remain. All of God’s children are still not flourishing. And so what are we supposed to do? We’ve got to roll up our sleeves, whether we are addressing the deep and lingering strands of discrimination and poverty, or whether we are bringing food and shelter and healing to the wounded in Haiti. Let us roll up our sleeves and build communities of human flourishing. That’s the dream. That’s the mandate for the work yet to be done. we will be able to hew out of the mountain of despair a stone of hope. Dr. King expressed so powerfully the two sides of the biblical narrative of suffering and hope. “The mountain of despair” stays with us. All of our Enlightenment efforts to eradicate that mountain will fail somehow. And yet, we must go about the business every day of crafting out of that mountain a “stone of hope” on which to build a better future. My heart goes out to everyone in Haiti. I cannot even imagine what they are going through. I did my best for the help of Haiti people. It does not take much for some type of disaster come and disrupt life and put us in a vulnerable position. It does not matter where you stay or how much money you have it can easily happen to us. So I am thankful for what I have and I will use some of that to help others. 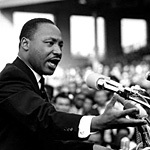 I love Dr King speeches because he spoke the truth and he accomplish his goal with out using violence that is impressive. David Brooks (sort of) addresses this same topic in a recent opinion piece: http://tinyurl.com/y9fnbmd. With all the money thrown at developing nations, why do some nations always seem to be treading water? In no way should The Have’s refuse to help The Have Nots in Crisis, but this also seems like a great opportunity for Haitians to do things differently as the rebuilding begins. And, then, for nations giving the aid, is this also the time to rethink how the money can have a lasting benefit for the people?